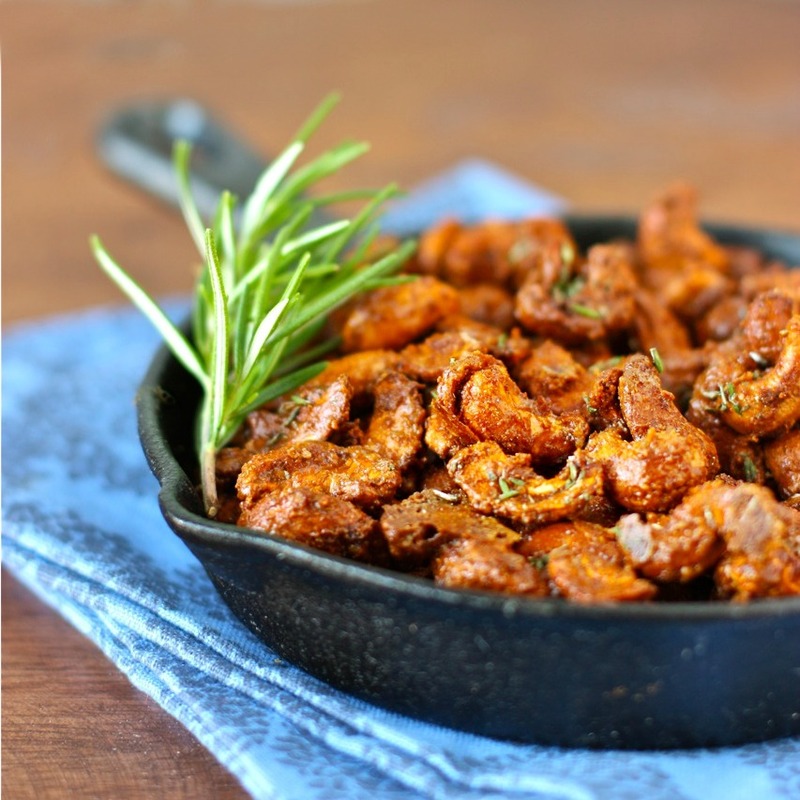 To this day, I still love cashews, so when I saw this recipe from Susan Eats London, I literally sprang up and got in my car to buy a huge bag of it. I thought for a moment of using a mix of nuts, but I knew I’d end up picking out all the cashews first, so I saved myself the trouble. These cashews are sweet, salty, and smoky with a slight hint of heat from the perfect combination of sugar and spice and everything nice, namely rosemary and orange. The original recipe included amchoor, a spice made from powdered dried green mango, which I had never heard of, but plan to find ASAP!! Instead, I substituted some zest and juice from an orange, which I thought would complement the spices very well. 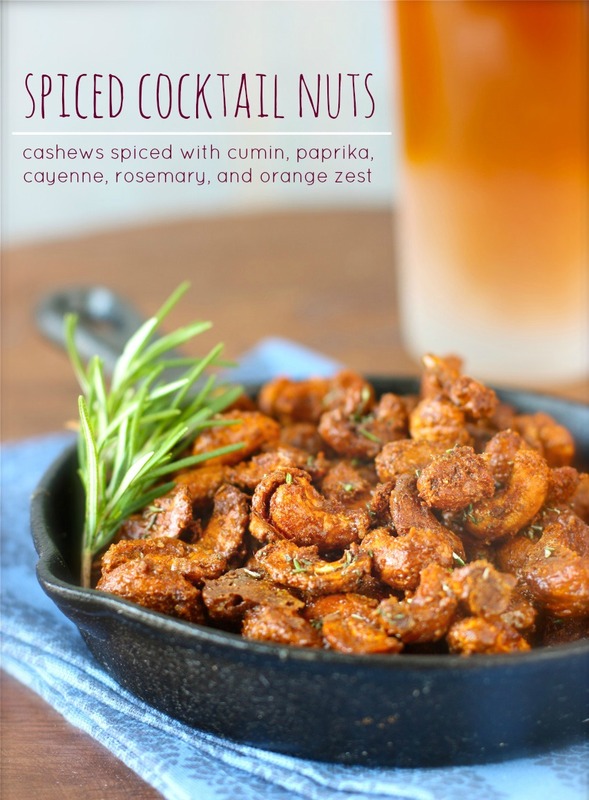 These spiced nuts will be a great new addition to the olives, cheese, salumi and other hors d’oeuvres I usually serve with cocktails, wine, and beer at parties. Heat oven to 300 degrees F. Line baking sheet with silpat or silicone baking mat. Set aside. In a small bowl, combine the sugars, salt, spices, and orange zest. Set aside. In a large bowl, beat the egg white with a whisk until completely opaque and foamy, about 1 minute. Add the dry ingredients and orange juice and blend thoroughly. Add the cashews into the bowl and toss to coat thoroughly. Spread the coated cashews in a single layer on the baking sheet. Roast in the oven for 15 minutes and then stir with a spatula to loosen any nuts that may be sticking to the baking sheet, keeping cashews in a single layer. Reduce the oven temperature to 250 degrees F, and continue to roast until the nuts are golden, about 10-15 minutes. Remove from oven and scrape the cashews off the baking sheet, breaking apart nuts that may have stuck together. Transfer to serving dish and garnish with chopped rosemary leaves. Serve immediately with a cocktail or ice-cold beer in a frosty mug. Adapted from Susan Eats London. This looks so goooood 🙂 I’m saving the recipe. I love cashews too! I never liked spiced nuts as a kid – I think I had one bad experience, but I think it’s time to try them again! Wow. I never thought to use an egg white! I imagine it really helps the spices stick. Thank you for this recipe. I love spiced nuts and I will try your recipe next time I make them. I especially like to make mine with pecans! Cashews are my favorite too! These look fantastic! must try this recipe out – thanks, Daisy! Yum yum Daisy! What beautiful photos! Love the adaptation. I will share amchoor powder with you when I see you in Seattle, it is wonderfully tangy. OH my – what amazing snacks these would make. Gorgeous, Daisy.